I was browsing online recently and came across a site called "Authority Hacker" that had some good articles on it. I saw a button for free training and was curious to see what they offered. Of course I clicked it and then was presented with an option to join a webinar. Anyway, I was curious to see what it was all about and patiently waited 5 minutes for the "live" webinar to start. 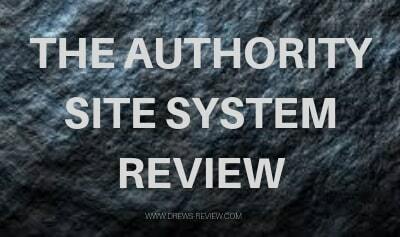 The host of the webinar, Gael Breton and co-founder of Authority Hacker - Mark Webster, put on a presentation about how to build an authority website and called it The Authority Site System. Now, normally (like a bad movie) I would click off if I already knew the direction they were going in (not a good one) but I started to realize that what they were teaching in this webinar is all too familiar to me. It's actually the same way I build authority sites. Almost every detail they gave was just how I do things, even using the same tools. I was intrigued. In the beginning Gael Breton says that he was planning on selling the content in the free webinar and he probably could. Afterall the hour or so of free training is probably better than a year subscription to a crap course like the Wealthy Affiliate I reviewed. The free webinar was honestly fantastic. 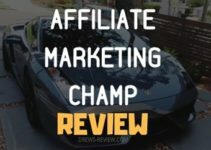 If I were to teach people on how to build an authority site in a niche and marry that up with some good offers that will bring in affiliate commissions, i'd probably teach it in the same way. ** In going through the training now that I have the course, i learned that there is a big update - TASS (The Authority Site System) is now in version 2 of the course. Here's a snapshot of the members area and my progress so far. The content is hidden and there's a lot! ​​​​If you buy The Authority Site System from the webinar, you'll get access to Authority Hacker Pro, which is the full course and The Authority Site System is included and part of that bigger course. 1- The basics of Online Marketing. Without buying the course (did that!) and just by seeing the titles of these modules I kinda get what the training is all about based on the free webinar they gave. It's most likely an expansion of the tactics explained. These 5 steps are pretty much the formula for building an authority site - it's actually not that difficult when you understand exactly what to do. I did find out that the training does come in both video and written format. I also found out that you are provided with a lot of templates with research they have already done on a niche. This is a great way to study what they do so you can mirror this with your own business. 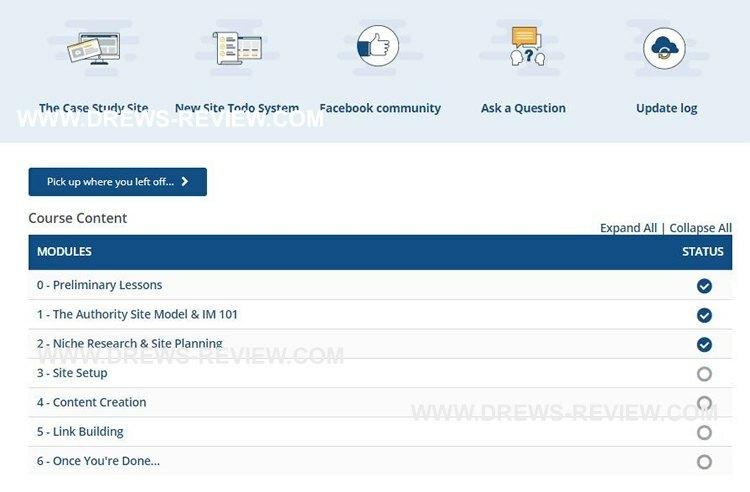 This section will help you to grow your authority websites and show you the exact procedures on how to do so. Seeing the topics above (there's actually much more) I can see that these guys know what they are talking about and understand the essential steps to take. The Authority Hacker also comes with live webinar training. I have not found out yet if this is monthly or weekly. Once I do I will post it here. Webinars are great if you can get on them live but they do upload the recordings. It's also my understanding that you can submit questions in advance. Great to have if you're not able to attend. Templates are a great way to make doing regular day to day processes much easier. There are several templates available such as Lead magnets, Email campaigns, Email Automations, Blog content templates and so on. 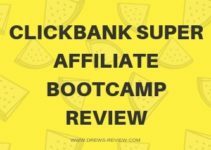 You'll be able to get into the Facebook group which is an advantage for newbies. If you're new you are going to have a lot of questions and sometimes sending an email to support may not be your best option. You'll be able to find an answer in the group as most people are willing to help. Now, I am speaking generally here and not just about this particular FB group. But there's definitely a sense of community within these groups of likeminded people and they do like helping out. So far I am seeing tremendous value with what you are going to learn. If I were to teach a course myself in building an authority website (much like mine is with ecom & affiliate marketing) the methods they teach would be similar to what I would. However, they go into WAY more detail and I simply would not have the patience to do that! I have bought the course and I am currently going through the modules. There's a lot of content so bear with me as I make my way through. 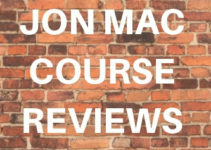 So far it's looking good and think this course is going to really help you guys in building an authority site that will drive traffic and make you money. Let me finish up though but if you have any questions in the meantime please feel free to reach out. In the meantime if you're curious, set aside an hour and jump on the free webinar to get an idea of what they teach and how you yourself can build an authority site. The link to the webinar again is here.